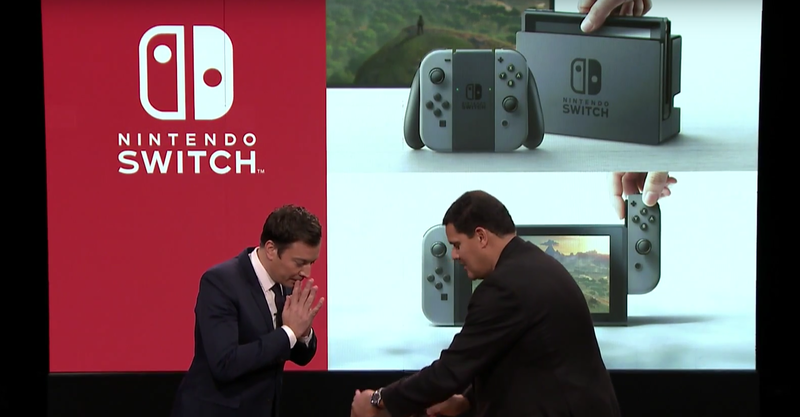 The Nintendo Switch has debuted during last night’s Jimmy Fallon show and the upcoming Zelda: Breath of the Wild was being played in front of its creator. President of Nintendo America, Reggie Fils-Aimé, debuted Nintendo’s new upcoming hybrid platform during the Tonight Show. Jimmy was first guided through Nintendo’s mobile title Super Mario Run but later presented with the upcoming new Zelda running on the Nintendo Switch as well. Zelda: Breath of the Wild was displayed running on both full screen and the Nintendo Switch display in handheld mode. Check out the debut of the Switch down below (skip to the 5 minute mark for the Switch part). Judging from the Zelda gameplay show, the game runs smoothly in both docked and undocked mode which should satisfy a lot of Nintendo fans. The Nintendo Switch will release in March 2017 and Nintendo will provide more details about the hybrid console during a special Nintendo Switch presentation on January 12. The platform will be playable for selected press on January 13.